Today I feel like featuring some pottery. I've recently come across a number of gorgeous pieces, so I wanted to show you a few of my favourites. There's just something about a gorgeous and unique vase full of beautiful flowers ... never fails to make me smile! And of course, vases aren't the only ceramics you'll find on Etsy ~ just check out the street team EtsyMud for all your pottery needs. My first featured artist (potter?) runs the shop called trpottery and really has a wide inventory of really neat sculptures and personality pots. 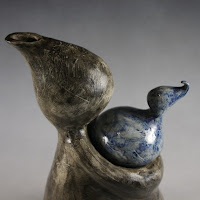 My favourite is this offspring sculptural vessel ~ it's shaped like a parent holding a child. Very sweet with a subtle colour difference between the mom and baby, this item would make a wonderful baby shower gift. Actually, this would make a superb gift for any mother or grandmother, at any time, though especially for first-time moms. I love how unique and original these designs are and that they are actually vessels that can hold liquid, if you wish. While you're perusing through this shop, be sure to check out these great tumblers. Functional and pretty, these glasses are microwave, dishwasher and oven safe (and you get two for a really great price). So no worries about having to do dishes or boiling water for hot chocolate. And the swirly, wavy pattern on them is just so pretty! I think I would keep these out on a visible shelf instead of putting them away in a cupboard! Run on over to trpottery, and check out the amazing selection (I just love the personality pots!)!! 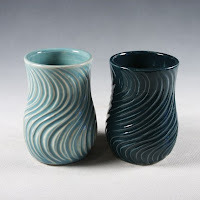 I saw this phat wavy vase from juditavill, and immediately fell in love. This piece is the reason I'm making this post. Isn't is wonderful? Doesn't it look lovely with those tumblers above? 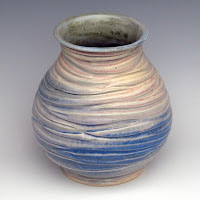 The delicate play between the blues and the pinkish-creams is stunning. This vase looks like it belongs in a movie, being dipped into a fountain and transporting water atop some woman's head. And as inclined as I am to put water in it (it just feels right), it would also be a show stopper if filled with bright blooms. Absolutely breathtaking. 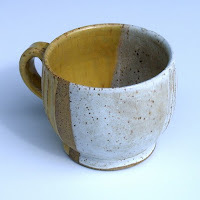 Another piece by Judi that I adore is this yellow/cream and speckled stoneware cup. So simple, this mug reminds me of some vintage mugs my parents had ~ we would have a cup of hot chocolate on those cold, rainy or slushy November days. The deep mustard-y yellow is reminiscent of both the gold of the changing leaves and November's topaz birthstone. There are up to 4 of these available ~ what a perfect gift for that November birthday! And if you're quick enough, you might be able to catch a similar yellow and cream glazed mug that is on sale at juditavill!! 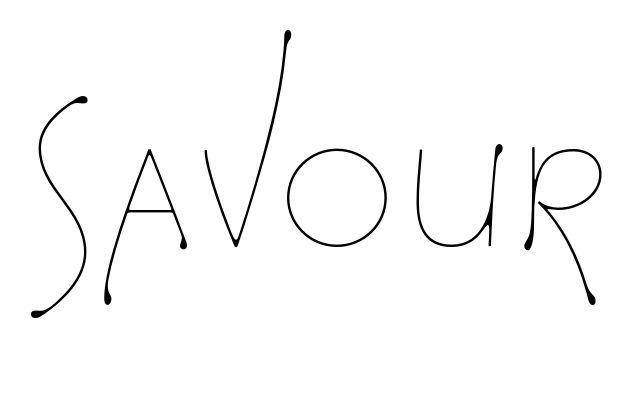 Last but not least is the bright and beautiful shop of KristinPavelka. 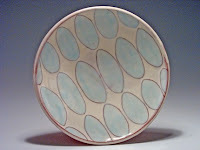 Isn't this plate - blue ovals funky? A nice deep dish that would be perfect for salads, pastas, stir fries ~ ooh! I can just see this piled high with chips or cookies at a party! It's so pretty ~ the icy blue and the bright red of the stoneware around the outside makes this a perfect dish to display candy in during the holiday season!! What a great gift idea!! 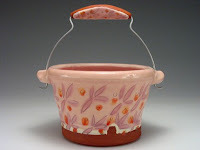 But the item that really led me to Kristin's shop is this wonderfully vibrant ice bucket - pink bird footprint. Although the pattern is based on bird tracks in the snow, it reminds me of bright spring blossoms. The colours as just amazing! It was designed to fit a tub of Ben & Jerry's ice cream with some ice so that you can go outside picnicking and enjoy. It would also be great for keeping dip cold at a party or as an Easter basket. So many possibilities!! Anyone else in the mood for some new dishes? Mugs? A vase or two? Maybe you're suddenly itching to do some (not that) early Christmas shopping? 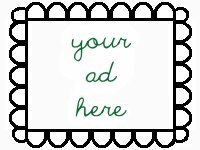 Be sure to hurry over and check out trpottery, juditavill and KristinPavelka. 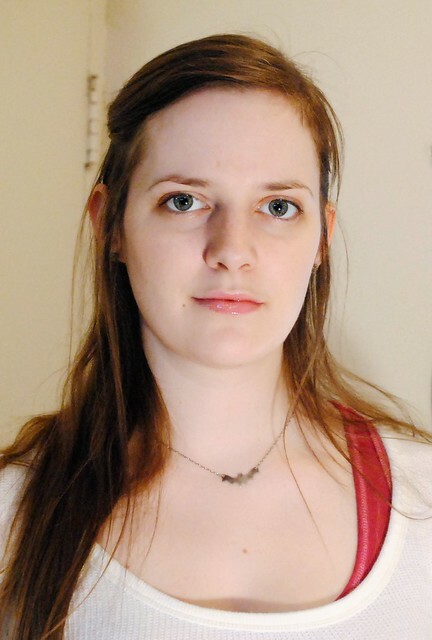 Thanks so much for the great review of my work! thanks... what a fun blog!!! !